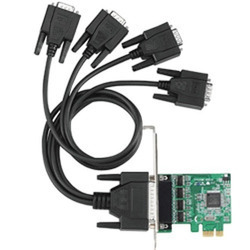 Our company specializes in manufacturing, supplying, distributing, wholesaling and exporting a qualitative range of Four Port RS 232 Low Profile PCI Express Card. To manufacture the offered range, we make sure that qualitative equipment are used by our experts. To ensure their safe transit, we make sure that the cards are packed in premium quality packaging material. 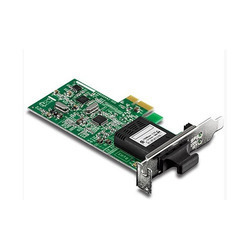 We hold expertise in manufacturing, supplying, distributing, wholesaling and exporting 8 Port RS 232 Low Profile PCI Express Card. All these products have maximum baudrate for superfast data transmission. Also, these express cards allow the user to connect eight standard RS serial devices such as PDA, scanner and printer. CA-PS89 allows you to connect 8 standard RS-232 serial devices such as PDA, scanner, printer etc. Backed by rich industry experience, we are manufacturing, supplying, distributing, wholesaling and exporting 2 Port RS 232 Low Profile PCI Express Card. Latest equipment and advanced technology are employed by our expert professionals in the production process. To cater to the diverse requirements of clients, we offer these cards in various specifications. We have emerged in manufacturing, supplying, distributing, wholesaling and exporting for our valuable customers a wide array of Low Profile 100 Base SC Fiber PCIe Adapter. The offered adapters provide a reliable high performance connection from a PC or server to a multi-mode SC-type fiber connection for distances of up to two kilometers. 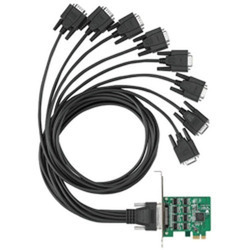 These are compatible with low profile form factor computers with an available PCI Express slot.